Renesmee “Nessie” Carlie Cullen is the half-vampire, half-human daughter of Edward Cullen and Bella Swan, born on September 10, 2006, on the day of Bella’s human death in Breaking Dawn. Her name is derived from the amalgamation of the names of Bella’s mother, Renée, and Edward’s adoptive mother, Esme. Her middle name, Carlie, is a combination of the names Carlisle, Edward’s adoptive father, and Charlie, Bella’s father. She has the same facial features and hair color as Edward, but the curly hair of her grandfather, Charlie Swan, and the brown eyes of Bella. She is described by Bella and Jacob as being the most beautiful person in the world, even though she is so young. Her family love her and will pledge their lives for her, along with the other vampire friends of Carlisle, when the Volturi attack. Her heart pumps blood, giving her a blush, and her pale skin glows in the sunlight. Her skin is very warm and soft to the touch, but is as strong as a vampire’s. Renesmee can survive on both blood or human food, though she prefers blood, and she doesn’t produce venom. Her special ability is being able to send someone a memory or thought by touching their skin. 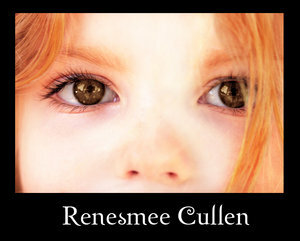 Renesmee grows both mentally and physically at a fast rate, being able to speak only seven days after her birth, and by the end of Breaking Dawn she is able to read, run, hunt, and perform other tasks at advanced levels for her young age. Her intelligence stuns everyone – Bella and Edward especially – as she can understand what is going on around her when the Volturi arrive. Jacob Black gives her the nickname “Nessie” because he considers her full name to be a mouthful, though Bella strongly dislikes him naming her child “after the Loch Ness Monster”. However, by the end of the book, all of the characters adopt this shortened version. She will reach physical maturity after about seven years, when her physical appearance will be around seventeen, and will then stop aging. After Jacob Black imprints on Renesmee, Irina, a vampire from the Denali Coven, sees Renesmee and believes she is an “immortal child”, a child who had been bitten by a vampire. She informs the Volturi, as immortal children are not allowed to live. Intent on killing Renesmee, the Volturi travel to Forks. However, the Cullen family members gather witnesses from around the world to prove that Renesmee is not an immortal child. Alice brings another half-breed, Nahuel, who explains what he is. No longer seeing Renesmee as a threat, the Volturi leave.